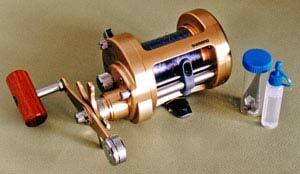 Shimano added the CT-700 to their Calcutta series of baitcasting reels in 1996. This larger model found immediate acceptance with many salmon anglers who cast a line for the “King of Fishes” in the surf at the mouths of the South Island’s big east coast rivers. That’s a generous load of line. It isn’t all needed to fight a salmon, its purpose is to prevent the line spool’s diameter from being significantly reduced as the line is peeled off during the cast. This results in much longer casts being possible. opposite side of the river, and side on in the channel. If it takes off downstream in these situations you can sometimes need 200 meters. Many salmon anglers prefer twenty-pound line when fishing the surf because it provides that little extra insurance against stone damage. This slightly heavier line weight also gives a little extra protection from bust- offs at crowded river mouths when your line often becomes tangled with your neighbours. The Calcutta CT-700 is physically bigger than the tried and tested Calcutta CT-400. The 400 can certainly be used for fishing the surf, but is ideally suited for up-river work. 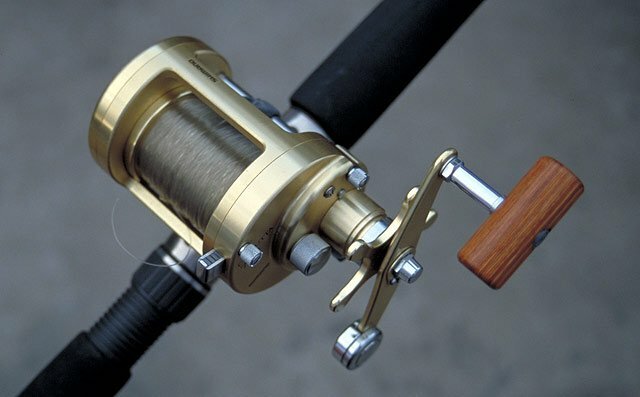 The bigger handle on the CT-700 tends to make the reel appear over large at first glance. However, the 700 is very lightweight being made from a one-piece forged aluminium frame, and precision aluminium spool. making very long casts out over the surf for a salmon. The ability to perform each of these rolls, to well above average performance, makes the Shimano Calcutta CT-700 excellent value for money! The Shimano Calcutta CT-700, shown right, is noticeably bigger than its sibling the CT-400. The large handle makes the 700 seem even larger. The CT-400 weighs 320 gms and the CT-700 weighs 538 grammes. For comparative purposes, the excellent Abu Garcia Ambassadeur 7500c weighs in slightly heavier at 585 gms. Note also that on the CT-700 the spool release button has returned to the “usual” place! Getting back to salmon angling, I couldn’t wait to head down to the beach with the CT-700 for my first cast. Having fished the impressive CT-400 for at least a season with excellent results I was very interested to see how it would compare. After a cautious start, I was able to make possibly the longest casts I have ever made in my life with this bigger model. The line slipped effortlessly from the 700 under only moderate power. As a word of warning the Calcutta’s are extremely free running. I found that unless I had three of the six spool brake weights switched to “on” I couldn’t cast without a bird’s nest. This is also the case with smaller CT-400. Just make sure you switch at least three to “on” to start with. You can always get your tackle store to show you how if you are uncertain. t is amazing just how far it’s possible to cast with this reel. I’m certain salmon anglers switching to it for the first time won’t be disappointed. The ability to produce extra long distance casts is what this reel is all about. In this regard, Shimano also produces a Calcutta CT-700S. This model is not a levelwind version. The non-level wind model may provide extra meters of casting distance due to reduced drag. However, I’d sooner have the level wind any day! The level wind takes away the need to carefully lay line with your fingers. Some anglers may prefer the CT-700S but not me. If the line is not spread evenly casting distance will be reduced and bust-offs will be inevitable. If you don’t intend to cast with the reel but prefer instead to use it only for trolling and bottom fishing then the level wind isn’t really necessary. The Shimano CT-700 comes complete with a cloth bag, a small bottle of lubricating oil, and a small plastic jar with a clip-on lid containing two complete sets of spare casting weights and a combined spanner/screwdriver tool. It is worth mentioning that the line guide could have been made a little taller. The line cannot come straight off a full spool but is instead forced down slightly in order to pass through the guide hole. If you overload the spool with line and so increase its diameter there is a tendency for overruns to occur because of this! So don’t overload the reel with too much line and you will be fine. Load only to within 3mm of the top lip. Drag smoothness on the Shimano Calcutta range of reels is excellent. I have fought many salmon on the CT-700 and found the drag to be among the best I’ve used. There is not the slightest hint of binding or grabbing. The line is pulled-off under pressure by a good salmon with the smooth effortlessness that you’d expect from a top-of-the- range Shimano reel. The drag uses molybdenum for a low friction surface so that the drag starts smoothly, and a titanium/cotton material which widens the drag pressure range. The Shimano Calcutta CT-700 also features Shimano’s Super Stopper anti- reverse system which uses a one-way stainless steel roller bearing to eliminate back play. This allows you to drive home the hook instantly. It also gives the reel a more sturdy feel when retrieving your ticer or fighting a fish. To see what I mean by back play, tighten the drag on your current reel. Then place the thumb of your left hand on the spool tightly to prevent it from turning. Now take the handle in your left hand and attempt to move it backwards and forwards. On the Calcutta CT-700, there is no movement or sloppiness in the handle at all! Shimano Calcutta CT 700 baitcaster. 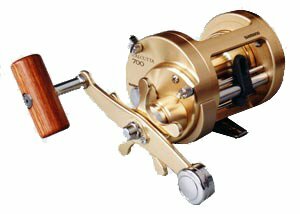 Note that many salmon anglers have replaced the longer single knob handle on their 700 with the paddle handle from a smaller Calcutta CT-400. The large handle is better suited to power winding when fighting a big sea fish. Whereas the smaller paddle handle balances better for the long hours of winding required for salmon fishing. This is just a personal preference thing. Overall the Shimano Calcutta CT-700 is an excellent product. 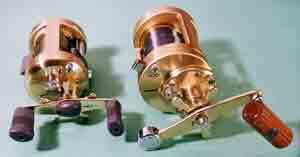 The reel is beautifully finished to a very high standard of workmanship. It is also built to last. I have fished mine for 8 years and have landed many salmon and kahawai on it without any problems at all. It is an expensive option for salmon angling but when you consider the many years of outstanding service it will provide, together with a “never let you down” reliability, and an excellent “precision feel” it is money well spent! Two stainless steel ball bearings and one roller bearing. One piece machined aluminium frame.